Fan Boy Forum: The hardest workin kid in comics! The hardest workin kid in comics! 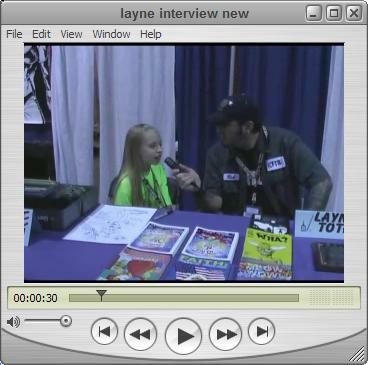 ICFTB.com and Fanboy Forum is proud to present.....Layne Toth, the hardest workin kid in comics! We just fell in love with Layne at Chicago and we know you will too. So set back and enjoy this exclusive interview, where we at ICFTB.com scoop everyone with who Layne will be working with soon. Do you want a hint? Check out the link. Also if you would like to know more about Layne check out her site and be sure to check out her bio. Fanboy Forum "Kung Fu Fighting"
Artist Alley, Wizard World Chicago!